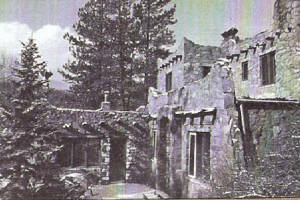 In 1930 a millionaire mason, Mr. Peterson, who lived in Denver bought the property with plans to build a summer cottage. He began using his unique masonry skills in 1931 and they are evident everywhere in the building we now call Stonehenge. Peterson’s signature “P” can be found in a tile in one of the fireplaces. He spared no expense while building such features as an office with a safe, a roof top sun deck, and marble for the dining room mantel, imported from Italy. 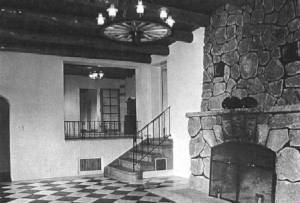 The black and white marble tiles found in the main living area floors were taken from the old East High School in Denver, that was being torn down at the time of the mansion’s construction. The original brand of the ranch, the one-heart-one, was inlaid into the terrazzo stairway. 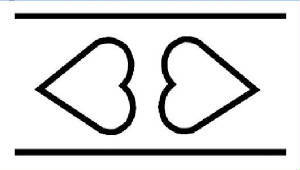 The ranch today has purchased that brand, which is called “bar-double heart-bar” as you see it used in the stone work. Some supplies were brought in by train, which followed the South Platte River. The completion of the Peterson home took 10 years. In the early 1940’s, the Peterson’s advertised the property for sale at $35,000, with 530 acres and furnishings included. In the 1950’s, Tenny & Jane Carter operated the property as Glen Cairn Ranche. Glen Cairn, meaning “pile of rocks,” was named for a ranch operated by one of the owner’s grandfather, a Cripple Creek miner. In 1943 The Carter’s began an extensive poultry operation, producing eggs. At their peak, they housed 10,000 chickens and sold the eggs to local restaurants, hotels and grocery stores. They constructed three buildings for their operations, using the main lodge as the brooders coop, thus explaining the low ceilings. The recreation hall, guest laundry, and the staff quarters, commonly called “the coops” by us, were the large specialized buildings housing the chickens. The Carter’s lived in the Stonehenge and the caretakers lived in the house that the May’s now call home. The Carter’s fell on hard times when the chicken business went to a more automated system, and they could not compete in the market. The property again went up for sale in the mid 1970s. Just beyond the fire pit, up until the 1930s, a full-size version a train much like this one, slowly rumbled to and from Denver. Gold & silver mining, lumber and tourism had prompted railroads to begin conquering the inhospitable wilderness of the Colorado Rocky Mountains, just after the Civil War. The narrow gauge tracks reached Bailey in 1878 and shortly thereafter they would be laid in what is now the backyard of the Wildhorse Lodge. There were no structures here then. The ambitious dreamers who founded this railroad hoped it would live up to its original name: The Denver, South Park & Pacific. It never got close to the Pacific but, in various branches, it got as far as Como, Fairplay, Breckenridge, Leadville and Gunnison - 149 miles from where you’re standing. The railroad slowly pushed into the mountains creating small towns along the way and a sturdy economy with numerous related jobs. As the Union Pacific pushed through the valley, Kenosha Pass became its biggest obstacle rising over 1000 feet in less than seven miles. Although a challenge, it was conquered and the South Park line began servicing the mountain country and boom towns like Leadville, St. Elmo, Fairplay, Alma, Como, and Breckenridge. “Narrow gauge” tracks - only 3-feet apart (about 20 inches less than “standard gauge”) – allowed for sharper curves, better traction and most importantly, lower cost. The mountain railroads were often constructed “on the cheap”. Iron, steel and stone were not used if plentiful wood would do the job. The owners figured they’d upgrade the roadbed, trestles and equipment after the money started rolling in. But most often it just rolled into the pockets of the owners. Wrecks were not uncommon. Neither were bankruptcies. The little railroad’s fortunes rose and fell with those of the mining, construction and tourism industries. It changed hands and names several times until, in 1899, it became part of the Colorado & Southern. That name stuck until the line was finally abandoned about 40-years later. At its peak, the railroad operated on 412 miles of track and in addition to mines and larger communities, it served small resorts and hotels all along the Platte river, some of which - like the lodge in Shawnee - were owned by the railroad which once planned a village where North Fork Ranch stands today. Popular weekend “Fish Trains” would drop-off and retrieve anglers anywhere between Denver and Grant. The C&S trains were often “mixed”, as in the display, simultaneously hauling passengers and freight. 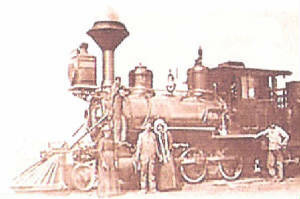 The locomotive shown is a Baldwin 2-6-0, widely used by narrow gauge railroads of the period. (The designation means 2 front wheels, 6 drive wheels, and no rear wheels as the tender was a separate car). One of the cars shown is a rotary snowplow which came in very handy during the notorious winters in the Rockies. The last trains rumbled through this valley in the spring of 1937. Within a few years, the abandoned railroad was completely dismantled. All that’s left now are mounds of earth designating the old roadbed and the occasional rusty spike. Highway 285 was first developed as a trade route through the mountains to Santa Fe, New Mexico via stage coach. In the mid 1800’s, gold and silver were discovered in the mountains, and by 1880, large numbers of people were migrating into the rugged mountains to stake their claims on land and to try and strike it rich in the mines. However, few were able to strike it rich. The few big strike areas quickly grew into towns and associated businesses rapidly developed. Prior to the arrival of the train and civilization, the towns were crude, rugged, and harsh. The need for supplies, communication, and reliable transportation increased and the Union Railroad began laying tracks to fulfill the need. Gambling, prostitution, outlaws, and gunfights were the norm during this time. The four local towns of the valley grew from the railroad. Bailey grew as a logging community and resort area with nearby Glen Isle a very popular weekend getaway and summer vacation spot. 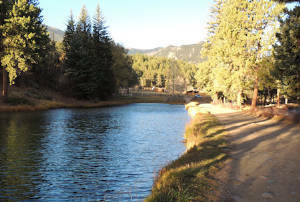 Many high society people regarded the fishing in the North Fork of the South Platte River as the best in the mountains and with its close proximity to Denver. The town of Grant arose due to the development of Guenella Pass road. The mining towns of Geneva City and Jack’s Mine produced silver into the 1950’s. Webster’s Crossing served as the end of the line for quite some time. 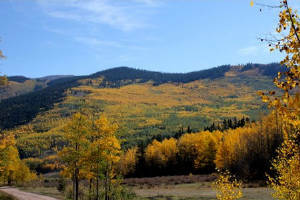 Nestled at the base of Kenosha Pass and Hall Valley, this town serviced travelers and miners from the Hall Valley/Webster’s Pass area. At one time, a hotel stood proud in its splendor; however, all that remains are a few abandoned homes, a graveyard, and a beehive (used in creating charcoal). The train bed is still very evident today as it winds its way up Kenosha Pass. The base of the water tank that filled the steam engines trains still stands to the south of the town. The sleepy town of Shawnee was once a “posh” summer community. Now it barely has fifty year-round residents. The Shawnee Hotel still stands as a private residence. Its general store/post office is still a social gathering for the locals to brood over the county politics. Before the age of refrigerators, Shawnee was the major ice producer for Denver. The ice cut from the ponds is still in the valley of Shawnee. The ice was shipped by train back to Denver, the Union Pacific’s return trip from Leadville. The loading ramps next to the ponds are still visible from the highway and serve as a reminder of the past. Logging was a large industry and many logs would flow down the North Fork of the South Platte River on their way to mills downstream. The timbers that were used in the mine shafts and in constructing the railroad tracks gave employment to many in the surrounding valley. The next boost in the canyon’s economy came with the construction of Robert’s Tunnel, 1.5 miles west of Grant, which took place between 1958 and 1962. The tunnel which runs 26 miles long, brings water from Lake Dillon and underneath the Continental Divide to supply Denver with its ever-growing water needs. Since that time, the valley has been in an increasing economic recession. The only industries now are resorts such as ours and summer tourism traffic. We as residents have a deep love for the valley and are committed to continuing to pass on the history which this valley holds.